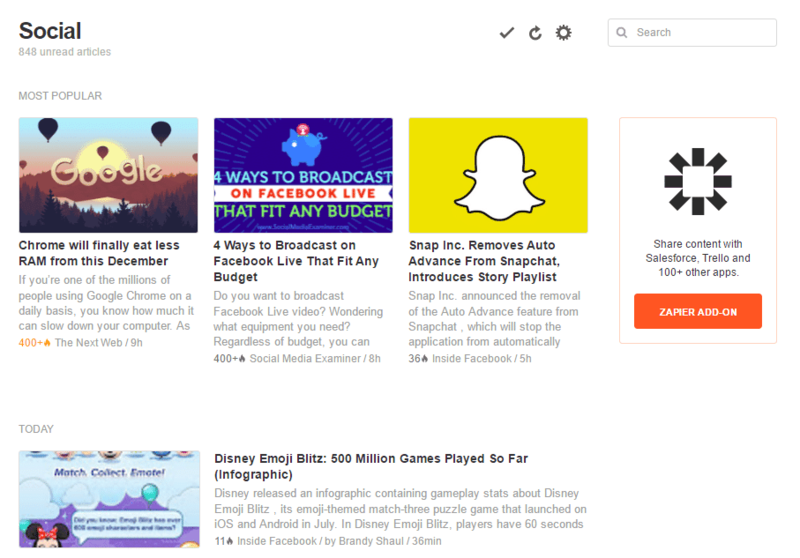 You've Never Used RSS Feeds for Social Media Updates Like This Before! You’ve Never Used RSS Feeds for Social Media Updates Like This Before! If you have been automating social media updates long enough, you are probably well aware that you can use RSS feeds to help populate posts for your social media accounts. It’s just one social media automation approach that I have been using for years with great success. I’m not saying this to be mean, but rather to let you know there’s a better way to do it. And when I show you how to get more out of this approach, you’ll be wondering why you didn’t think of it sooner. As you can see, there’s quite a bit to cover – so let’s get started. Before we get going, let’s first cover what an RSS feed is. Not sure what all that means? No problem, you don’t need to for the purpose of this blog post. But lucky for you, if you drop the RSS feed into a feed reader it will parse the XML data into a readable format making it easy to read. RSS feeds are commonly used to automatically syndicate data, for example blog posts. As seen in the image above, RSS feeds can be very useful in distributing your content automatically. Your social media accounts will automatically post a new update whenever there is a new item in the RSS feed. By using this approach, you can easily add new social media updates automatically to your social profiles. And when you are using a variety of feeds from multiple sources, your social media accounts are actively sharing content from other sources than you. Let’s face it, you won’t get too far on social media if you are only pushing your own agenda. By sharing stuff from other people, you diversify your social content. But there’s a significant flaw in this approach. If you have used RSS feeds to add content to your social media profiles, you are aware that they only work when new content has been published and ultimately added to the feed. So if you are using your own RSS feed to push updates to your social media profiles, you’ll get one update out of it. Then you’ll scramble to publish your next post and repeat the same archaic process. And if you are not publishing all the time, then using RSS feeds for social media content doesn’t do you much good since there won’t be anything new in your feed to publish on social media. So who says you can only post something once on social media? It’s definitely not me, and I believe you can even more out of not only your RSS feed but the feeds of others by using them again and again. So stop looking at RSS feeds as a one-and-done social media update and start looking at them as an evergreen utopia of never-ending content for your social media profiles. I mean, you use your social media images more than one time? Right? Well don’t you think it’s time to have the ability to recycle content from RSS feeds? Wouldn’t it be great if you could add content from RSS feeds again and again to your social media profiles? Not a one-and-done approach offered by all other social media tools. Rather a way to endlessly re-use data from a RSS feed to automatically post to your accounts. Think of it as recycling RSS content. And it’s entirely possible using the combination of Buffer & Bulkly. Want to recycle content from RSS feeds to post on social media automatically? Be the first to know when Bulkly is ready Click here to be notified. For those not familiar with Buffer, it’s a social media scheduling tool. Bulkly provides a few creative ways to automate the adding of content to your Buffer queue. Once such feature is Bulkly’s “RSS Upload” feature. This feature allows you to add a number of RSS feeds into your Bulkly account. And when you enable certain settings in Bulkly, you can utilize these feeds in ways you never thought possible. 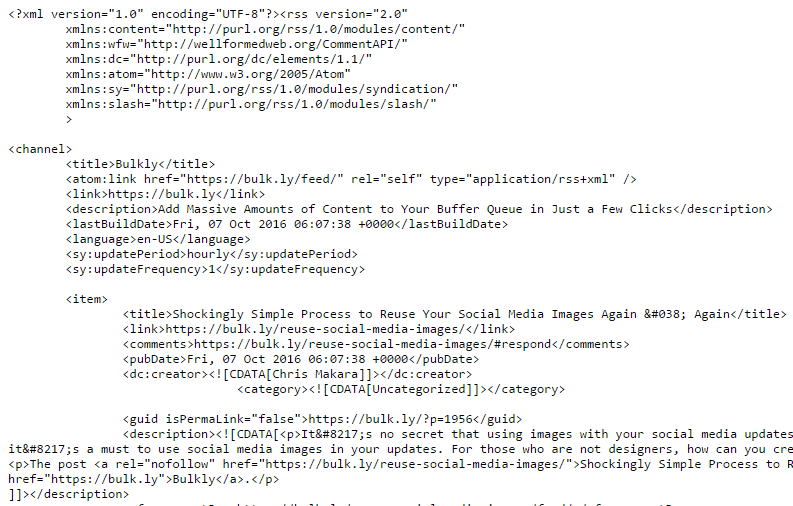 So let’s take a look at how you can use Bulkly to get more out of your RSS feeds on social media. Once you have created your Bulkly account, head to your dashboard and click on the “RSS Automation” button. The “Upload RSS Feeds” option will let you upload a CSV file with the list of RSS URLs you would like to use. You can download a template file from the link below the button in the RSS Automation overview page. Here’s what the CSV file looks like once you have added some data to it. Be sure to save your CSV file and then upload it to Bulkly by clicking the “Upload RSS Feeds” button and selecting your file. Should you want to bypass the use of Microsoft Excel to create a CSV, you can use the online interface of Bulkly to create your list of RSS URLs. Just click on the “Add RSS Feeds Online” button and manually add your RSS URL data. When you are ready, click the “Save” button. You’ll then be taken to your “Pending” tab to double check your data. From here you can edit or add hashtags or delete any feeds you don’t want to use. The key here is to enable the “Repeat” and “Shuffle” options in that this will not only continuously add content to your Buffer account, but also randomly pick content from your feed URLs (not just the most recent). 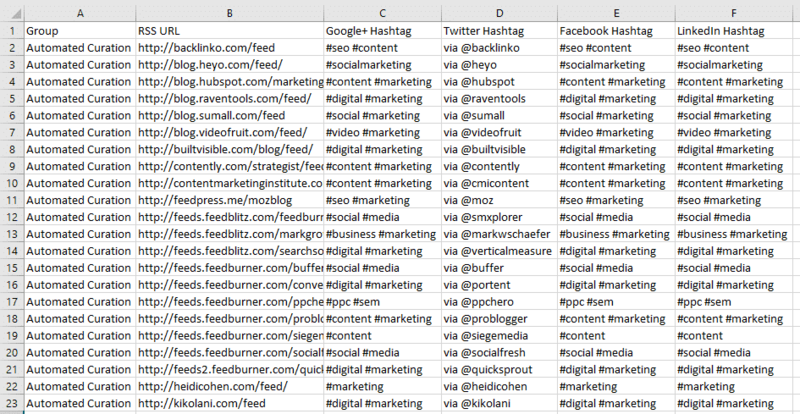 Then select which social media accounts in Buffer should get this group of updates. Just be sure to click the “Activate” option to activate the group on Bulkly. You might have noticed in my hashtag section for Twitter, I actually used the “via @username” to essentially tag the website/author each time Bulkly posts something from their RSS feed on Twitter. This works really well in that the author/website will see you actively sharing their content. It’s a good way to get on the radar of some major influencers with ease. While at other times, it might be a text link tucked away in the footer. Or when all else fails, you can sift through the source code on the page to find it. However, if you aren’t into guess work or wasting your time skimming pages and source code there’s an easy way to find the RSS feed of a site. Once installed, just click the icon for the extension and then copy the URL of the feed shown in the window. Then you can paste the RSS URL into your CSV file or Bulkly’s “Create it Online” interface. In a matter of minutes you can create a nice library of RSS feeds to source content for your social media accounts. Say good-bye the days of RSS feeds only helping you out when something new gets posted to them and hello to a never-ending source of content for your social media updates. Isn’t this a powerful, yet simple approach to maximize RSS feeds for your social media updates? I’ve been using this approach for quite awhile now with great results. It allows me to diversify the social content that gets posted to my profiles as well as helps build relationships with industry influencers. And best of all it’s all done automatically once set up. So tell me, is this approach something you plan on implementing in your overall social media strategy? Let me know in the comments how you will be using this to your advantage.